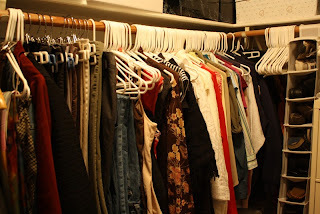 For MONTHS, I've been talking about purging my closet of unused clothes. And that's all that I've done...talk about it. So, it became one of my goals for the New Year. However, because I do it so rarely, cleaning out my closet was such a daunting task. I haven't really done a thorough sorting of it since I was pregant with Lucie over two years ago. At that time, I boxed up clothes that I could no longer fit into...and there they sat until yesterday. Enlist the help of a friend. My hubby helped me out by taking care of the kids when my project took longer than their naps, but I didn't have anyone helping me decide and sort the clothes to donate. Some help might have made it a little more fun AND easier to make decisions. Put on music or a movie. To trick myself into thinking that this project was at least slightly enjoyable, I played a movie on the computer in my room. Usually when I work on a project like this, I choose a movie that I've seen before (or a story that I know very well) so I can still concentrate on the task at hand. Last night, I chose Mansfield Park on Hulu since I've read the Jane Austen novel several times. Personally, I didn't care for this version of the movie because it was rather unfaithful to the book, but it did keep me going. Organize discards as you go. I made the mistake of throwing my discards on the floor rather than sorting and packaging them up as I went along. (This is where a friend would come in handy!) The result? A huge mountain of clothes that I needed to deal with AGAIN. My girls enjoyed scaling the mountain. I, however, did not enjoy tripping over it and being discouraged at the sight of it because it reminded me how much work there was yet to do. Choose a way to organize the "keepers" that works for you. I chose to organize the "keepers" by color within broad categories. I put all my slacks, jeans, dresses, skirts and tops in sections. Then, I organized each of those sections by color. This helped me see at a glance what colors of each type of item I own. Hopefully, this method will help me keep it organized because it is easy to see where the clean laundry is to be put away. The added bonus is that it just looks nicer sorted by color! Reward yourself! Before you start the task, decide how you're going to reward yourself when you complete your project. It will keep you focused and give you something to look forward to when you're done. So, what was my reward? A clean and organized closet...and an online shopping spree for some new clothes at Victoria's Secret with some of my Christmas gift money! I LOVE shopping for clothes at VS -- they have a great selection of clothing and almost always have great coupon codes. Right now, they are having their Semi-Annual Sale, and I scored some great deals on clearance items. I linked up to VS through Ebates for an extra 2% cash back AND used the coupon code VS20XTRA (good until tomorrow) for an extra 20% off clearance purchases. I can't wait for my order to come!